US President Barack Obama and then-Russian President Dmitry Medvedev signed the New START treaty, promising to reduce their stockpiles of nuclear missiles and launchers. However, this year’s right-wing coup in Ukraine, organised by the US and European Union, followed by a campaign of sanctions and war threats against Russia, combined with the Obama administration’s “pivot to Asia” aimed at asserting US control over the Asia-Pacific, are provoking a new nuclear arms race. Shortly before he was fired last week, US Defense Secretary Chuck Hagel used two separate Pentagon studies, arising out of the drugs and academic cheating scandal at nuclear bases, to authorise the US Department of Defense to request a further 10 percent increase in funding to upgrade its nuclear infrastructure every year for the next five years. The nuclear arm of the military will be given a higher profile, with the commander of the US Air Force Global Strike Command promoted from a three-star to a four-star general, and the head of the service’s nuclear integration elevated from two-star to three-star rank. Hagel’s announcement came on top of the Obama administration’s approval in September of 12 new missile submarines, up to 100 new bombers, and 400 land-based intercontinental ballistic missiles (ICBMs) costing $355-billion and possibly as high as $1 trillion. According to the Bulletin of Atomic Scientists, the US currently maintains an estimated 4,650 deliverable war heads, 2,120 of which are currently deployed on ballistic missiles. Testing of missiles has also increased. On November 7, two cruise missiles and one ballistic missile were destroyed over the Pacific Ocean by a similar number of interceptors fired from a destroyer in order to assess the response of the Aegis missile defence system to several attacks at once. A land-based variant of the Aegis system is planned for deployment in Europe. For its part, Russia is spending $560 billion on modernising its military over the next six years, with 25 percent set aside for its ageing nuclear forces. Currently, the Kremlin has a total of 1,643 ballistic missiles, an increase of 131 since March. Earlier this month, Russia conducted its most comprehensive nuclear weapons drill to date involving its entire “Nuclear Triad” of strategic bombers, submarines and silo-based missile systems to evaluate its preparedness for an attack. A Topol-M silo-based ICBM capable of carrying up to six nuclear warheads with an individual yield of 800 kilotons was tested. 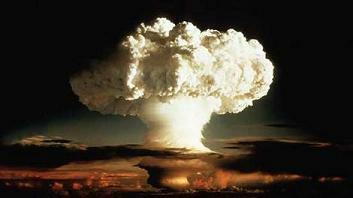 The devastating power of such a bomb can be seen when compared to the single 13-18 kiloton atomic bomb dropped by the US on Hiroshima in 1945, which led to the deaths of up to 166,000 Japanese civilians. Missile tests from submarines have also taken place, including Russia’s newest Bulava ICBM, with a range of about 5,000 miles and the capacity to carry an unprecedented 10 nuclear warheads. China also is developing missiles that will be able to reach any area of the US for the first time, and recently launched its first nuclear-powered submarine belonging to the Jin-class, which will carry a dozen ICBMs. Recent estimates suggest China has no more than 75 ICBMs. Pakistan and India are also attempting to modernise their nuclear arsenals and both countries have test-fired new missiles recently. Over the past few months, the US and Russia have been accusing each other of breaching the 1987 Intermediate-Range Nuclear Forces (INF) Treaty, which called for the elimination of nuclear and conventional ground-launched missiles able to fly between 300-3,400 miles. The crisis provoked by the US and its European allies, centring on Ukraine and NATO’s eastward expansion towards Russia’s borders, and the parallel “pivot to Asia” targeting China, has brought the world the closest it has been to global war since the Cuban Missile Crisis of 1962. Any belief that a nuclear war is impossible because modern governments would not risk catastrophe is disproved by the rapid modernisation of nuclear weapons and their delivery systems. Beset by mounting economic and social problems for which they have no progressive solution, the ruling elites are increasingly inclined to see war as a risk worth taking.